Galápagos Marine Ecology (UA ECOL 496O/596O, 6 units) is an opportunity for undergraduates and secondary school science teachers to study in the Galápagos Islands, Ecuador. This approximately 18-day course begins on the Island of San Cristobal. 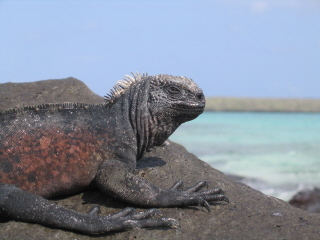 We explore different habitats on land and sea and learn about many of the unique animals and plants found only on the Galápagos. You learn firsthand why these islands are considered the birthplace of evolution and of Darwin's revolutionary idea. The experience includes a service project with a local school and/or with the Galápagos National Park. After our time in San Cristobal, we travel by boat to Isabela and Santa Cruz, and to an uninhabited island and discover how the different environments of each island have led to the evolution of different organisms. You have opportunities to snorkel with sea lions and sea turtles, see marine iguanas feeding under water, visit areas with nesting seabirds doing courtship displays and tending young, and hike the active volcano of Sierra Negra. The course consists of lectures, readings and discussion on topics on ecology, evolution and conservation. 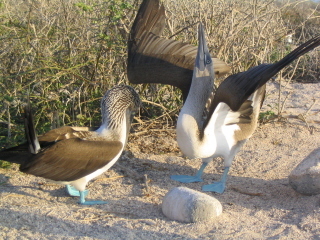 Each student is responsible for an "expert topic" paper and presentation prepared before class begins on a Galápagos animal or plant, a field ecology investigation and poster presentation with a partner on a topic of student choice, attendance at lectures on Galápagos ecology and evolution, and participation in class discussions and written reflections. We stay in hotels in towns on the islands, and eat in local restaurants. This gives you an opportunity to meet the people of the Galápagos, to practice your spanish, and to learn about life in a different country and culture. Costs for 2013: The cost for the course this summer (2013) is $5,070, based on an enrollment of 10 students. The above cost includes the Study Abroad Program fee, 6 units of UA credit, roundtrip airfare from Guayaquil to the Galápagos, the cost of all lodging, ground transportation, and field excursions, entrance fees to the islands, guide fees, breakfast every morning, and some lunches and dinners. The price does not include your roundtrip airfare to Guayaquil, Ecuador, and some of your meals. Restaurants are cheap in the Galápagos and the food is great! If more than 10 students enroll, the course cost will be less. Transfer from airport to downtown hotel in Guayaquil near the Malecón. Visit Parque Seminario (Iguana Park) and Parque Histórico (wildlife & botanical garden); afternoon: walk along the Malecón on the Rio Guayas and stroll to the top of Cerro Santa Anna for sunset and view of the city. Transfer to airport for flight to the Galápagos, check-in at B&B, San Cristobal; after lunch, overview of the town of Puerto Baquerizo where we will be staying, hike to La Lobería (sea lion colony), Playa Mann, or Tijeretas for snorkeling. Evening: readings discussion. Visit Galápagos National Park Interpretation Center in Puerto Baquerizo; hike to Tijeretas (Frigate Bird) Hill to snorkel; lecture by Dr. Diego Quiroga at GAIAS Field Station on marine conservation in the Galápagos; explore the plants and animals of the Coastal and Arid vegetation zone including Darwin’s finches; field exercise and readings discussion. Day trip to the highlands of San Cristobal including El Junco lake and La Galápaguera (Galápagos tortoise refuge and breeding facility); explore the plants and animals of the Transition, Scalesia, Miconia, and Fern-sedge vegetation zones. Lunch in the highlands at Rancho Voluntad De Dios. Lecture and readings discussion. Morning boat departure to Kicker Rock, Isla Lobos and Cerro Brujo to snorkel and explore; great opportunities to see seabirds such as boobies, pelicans, endemic seagulls, petrels, shearwaters; excellent snorkeling with plenty of reef and pelagic fish, marine iguanas, rays, turtles, white tip reef sharks and occasionally a hammerhead. Afternoon/evening: exploration on own, lecture and readings discussion. Class field projects, snorkeling, terrestrial exploration, lecture and readings discussion. Morning volunteer project with the Galápagos National Park or a local school (Liceo Navál). Afternoon/evening: class field projects, snorkeling and terrestrial exploration, lecture and reading discussions. Hike to Las Negritas cliffs to see seabird breeding colony including red-billed tropicbirds and Galápagos swallow-tailed gulls; snorkeling at La Lobería. Afternoon/evening: class field projects, lecture and readings discussion. Morning speed boat to Santa Cruz Island; transfer to hotel; afternoon visit to Charles Darwin Research Center; lecture and readings discussion. Day trip to N. Seymour Island to view colonies of breeding frigate birds (2 species), blue-footed boobies, swallow-tailed gulls, and Galápagos sea lions as well as land iguanas and a number of endemic plants. There will also be an opportunity to snorkel off of N. Seymour, followed by a stop at a beach on Santa Cruz to explore, relax or snorkel again, your choice. Speed boat to Isabela Island, transfer to hotel. Afternoon beach & natural history walk; work on class projects, lecture and/or readings discussion. Morning departure to Tintoreras Lagoon located on a small island near Puerto Villamil. Hike the trail around lagoon to view a congregation area for white tip reef sharks, a mating area for green sea turtles, spotted and eagle rays, a nesting beach for marine iguanas, and dense congregations of young marine iguanas. During the boat ride from Villamil we’ll see Galápagos penguins and lots of seabirds; the return trip to Villamil will include a snorkeling stop and an opportunity to see penguins in the water. In the afternoon, we go by mountain bike to the Wall of Tears to explore the spectacular Coastal and Arid Zones of Isabela with its unique plants and animals including a diversity of land birds including 4 species of Darwin’s finches, wild Galápagos tortoises, and mangrove wetlands with flamingos, herons, ducks and shorebirds. Evening: work on class projects. Departure to the highlands of Isabela; hike around the rim of Sierra Negra Volcano (second largest caldera in the world) to a Volcán Chico, and active volcano; while on the hike explore/experience a new lava field, fumaroles, unique highland plants and animals including Galápagos hawks, spectacular views of Fernandina and the northern volcanoes on Isabela. Afternoon: explore the diverse terrestrial habitats of Isabela and/or snorkeling at Perla de Concha to see more reef fish and sea turtles. Morning boat ride to Cabo Rosa and Los Tuneles for snorkeling; this area consists of an array of lava tunnels whose ceilings have been eroded away by the sea; it’s home to a wide variety of sea life that find refuge within the calm waters including green sea turtles, rays, reef fish, and white tip reef sharks. Afternoon: explore on own, work on class projects, lecture and/or readings discussion. Snorkeling, exploration of the diverse habitats of Isabela; Evening: presentation & posters on class projects. Early morning departure back to Puerto Ayora, Santa Cruz, hotel check in. 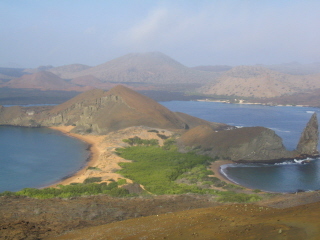 Hike to Tortuga Bay or trip to Los Gemelos to view the unique plants and animals of these twin pit craters. Evening presentations & posters on class projects. DAY 19: MONDAY, JULY 29: SANTA CRUZ – GUAYAQUIL – DEPART FOR U.S. Transfer to Baltra airport for flight to Guayaquil. Upon arrival, transfer from airport to downtown with opportunity to visit artisan market for shopping; group dinner on the Malecón; return to the airport for overnight flight to Miami. DAY 20: TUESDAY, JULY 30: ARRIVE U.S.
Connect in Miami to domestic flights.